Dune is a 1992 video game, based upon Frank Herbert's science fiction novel of the same name. 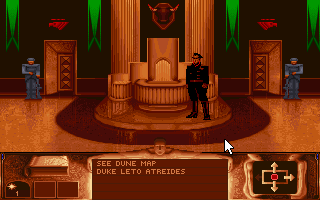 Developed by Cryo Interactive and published by Virgin Interactive, is the first of the Dune computer games. Dune blended adventure with economic and military strategy, and is considered by many the most immersive Dune computer game. Loosely following the story of the novel, the game casts the player as Paul Atreides, with the ultimate goal of driving the Harkonnen from Planet Dune, while managing spice extraction, military, and later, ecology through the native Fremen tribes. As the player progresses, his troops are equipped with weapons from "crysknives" to atomics, tap into Paul's latent psychic powers, and get acquainted with such characters from the book as Chani and Liet-Kynes. Available for the Amiga and IBM compatibles, it was one of the first floppy games to be converted to CD format, which included footage of the David Lynch movie, voice-acting for all speaking roles, and highly improved, 3D-rendered travelling and location screens. This version (a mix of the Amiga graphics and the extras of the PC-CD version) was also released on Sega's Mega-CD console. Also worthy of mention is the audio track created by Stéphane Picq and Philip Ulrich, released by Cryo (formerly Exxos) on the now extremely rare album Dune: Spice Opera.